This blog post was written as part of the PinAddicts challenge, where a group of bloggers actually made crafts inspired by some of the things that they had pinned! 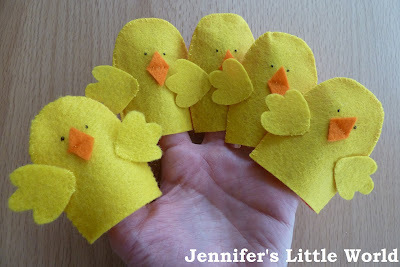 These felt ducks were inspired by a pin from ohsofelty, although they are sadly no longer available. I've posted before about how Harry loves acting out stories and rhymes using props. 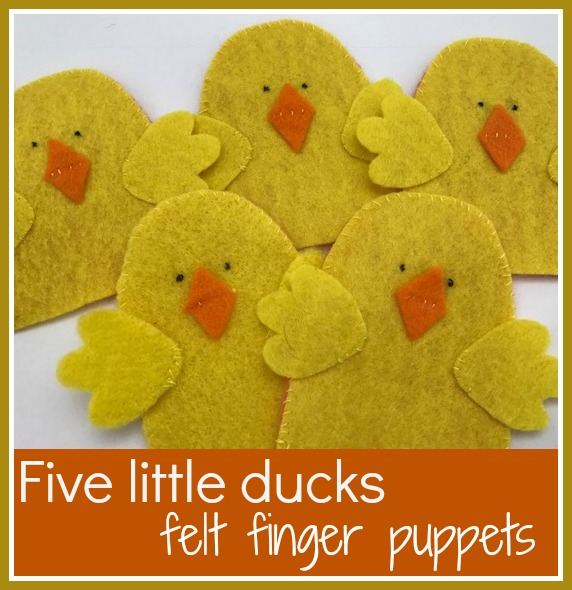 I've seen some great ideas online, and one that caught my eye was some felt ducks to use when singing the children's song "Five little ducks went swimming one day". ﻿﻿﻿﻿I didn't have much yellow felt left, but I was pleased to make use of some which was rather poor quality (I think it may have come in a reduced children's craft kit). I didn't have enough yellow to make the backs, so I used felt in a pale coral colour. They were very easy to make, I just drew out a basic template for the body shape and cut out the two pieces and sewed them together. The wings and the beak are sewing on separately, with tiny stitches for their eyes. My finished puppets came out quite big, which makes them a little uncomfortable to hold, but you don't need them all in place for very long as you sing the song! However it does mean that they are too big for a small child to hold, so next time I would make them a bit smaller. I had assumed that he would be quite happy to sit and watch, but of course he wanted to join in too! And all five ducks came swimming back! Thank you! It is a lovely song, I've been singing it a lot lately! I might actually steal this idea! My little girl got a finger puppet theatre for Christmas but the puppets that came with it don't really tell a story so I've been thinking of making some. This would be perfect as she loves that song! I love puppets, and so does my son. I'm thinking about doing monkeys for five little monkeys jumping on the bed next! They are pricey aren't they, I saw some in the garden centre and was shocked at how much they cost when they are so simple to make and cost hardly anything in terms of materials. So cute, I think my patience would have run out after I'd finished the first one though! Yes it's true that it wasn't very interesting making them all the same, luckily they were quite quick to make! Bless, they are lovely, they would make lovely gifts too. We had a shop bought knitted set of finger puppets to go with the Little Red Riding Hood story, but we didn't manage to keep them together as a set for long! LO liked playing with them too much. That's another good idea, we like that story! I'm slowly putting together lots of props for stories, then I'm hoping that it will develop into Harry using them to make up his own stories...we'll see! Soooo lovely! Ramona will actually have a coniption if I make these for her, she is IN LOVE with the ducks! How and when do you find the time to...? First barbecue of the summer!